Kimberly Wilson has been a freelancer since 2009. She also works as a marketing and sales professional. Wilson specializes in mental heath and wellness articles for various websites. She has a Bachelor of Arts in psychology from Syracuse University. Children who wish to participate in sports have a large menu of options to choose from. Sports are generally considered a healthy and educational activity for youth. According to The Center for Kids First, 30 million to 40 million children get involved in organized sports in the course of a year. However, between the purchasing of equipment and uniforms and driving kids to games and practices, parents may wonder if statistics prove benefits or drawbacks to sports participation. The first thing you may think about when you consider putting your child in a sports program is how much enjoyment he will get from the experience. 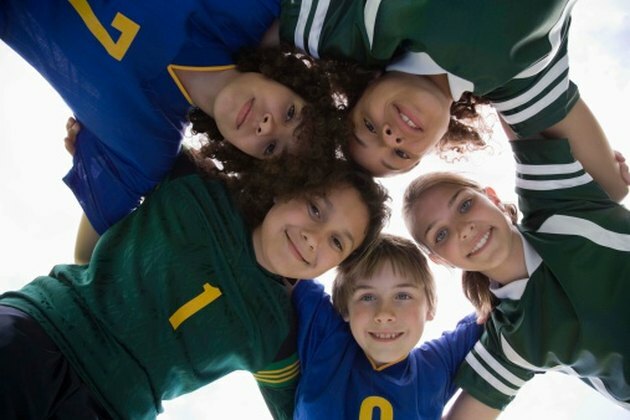 The Center For Kids First, reporting on a survey by the Athletic Footwear Association of 20,000 kids, says that 65 percent say they join sports to spend time with their friends. Improving skills does not attract kids to sports; only 20 percent gave that reason for participating. The President's Council on Physical Fitness and Sports reports that the percentage of overweight youth 6 to 19 has tripled since 1980. Further, physical activity provides real health benefits for children and teens. Education.com finds that sports participants learn to cooperate with their teammates, take instruction from coaches as well as the three P's patience, practice and persistence. No matter how careful coaches and parents are, children risk injury in sport activities. Children's Hospital Boston says that 3 million injuries occur each year and one-third of all injuries in children happen during sports activity. Most of the severe injuries come from participating in individual sports. The activities responsible for most of the head injuries are bicycling, skateboarding and skating. Children who have just begun a sport or activity have the highest risk for injury; parents should monitor their beginners closely. The odds don't favor any one child becoming a sports star or winning a scholarship through sports. The Center for Kids First reports that for the 284,000 boys playing soccer in high school, there are only 3,306 full college scholarships available. Of the 1 million boys who play high school football, only 150 make it to the NFL. For a high school basketball player hoping to reach the NBA, the odds are 10,000-to-1. Can You Exercise After a Minor Head Injury? Which Sport Causes the Most Injuries?